If you are thinking of doing pregnancy exercises and you know the precautions to take, you will help your body get ready for labor and delivery, safely. Your body is changing and you can easily strain muscles. This article will help you understand the precautions with exercise during this time, and give you some ideas for safe exercises. Remember to check with your doctor before starting any exercise program. 1) Avoiding exercise that requires you to lie flat on your back. 2) Do not lie on your stomach. 4) Do not do any high impact exercises. 5) Avoid exercises that require you to stand in one place for too long. 6) Avoid exercise that puts you at risk for body contact or falling. 7) Try not to exercise at high altitudes above 6.000 feet or scuba diving. Squatting is an excellent exercise, right up until delivery. Many midwives have you squat to use gravity for bringing baby down into the pelvis and helping it open up. Use the back of a chair to stabilize yourself. Hold on while standing with both feet firmly on the floor about a shoulder width apart. Lower your body while bending your knees and bring your bottom down as far as you are comfortable. Sit in this position 10 to 20 seconds, and while holding on, slowly bring yourself back up to standing. Caution: Avoid this exercise if you have any pain in the pubic area. Avoid doing this if you are having pain in your groin area. Your doctor may allow squatting if you have placenta previa and are at risk of it rupturing. 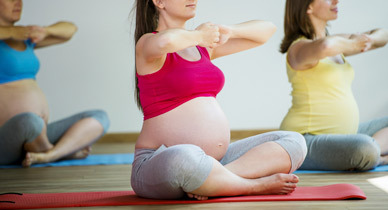 Yoga is one of the best pregnancy exercises third trimester and precautions are few with these two poses. This is a modification of the yoga position, “legs up wall,” which is originally lying on your back. You will lie on your left side with your head on a pillow. Your bottom and legs will be touching a wall and you stretch out into an “L” shape. Breathe in deeply and as you exhale, bring your right leg up until your legs form a “V.” Stretch your groin gently as far as you can tolerate and hold. Take in a deep breath and exhale, then bring your legs back together. Repeat 5 to 8 times. Caution: Do this stretch with your right leg only, while lying on your left side. This allows the most blood flow to your baby. Lying on your back or right side can compress the major blood vessels that bring oxygen to your baby. The yoga position “Cat Pose” can help relieve any pain in your lower back, and help your baby turn into position for birth. It can also help relieve the tremendous heavy feeling in your lower pelvis. Get down on the floor on all fours. Place your knees and hands about a shoulder width apart. Place your head in the center and look down at the floor. Take a deep breath and exhale. As you exhale, pull your belly up to your spine and arch your back like a “cat.” Drop your head towards the floor and pull your hips down and in. Hold the arched position for a few seconds and as you take your next breath in, bring your spine and hips back into the original position. Repeat 5 to 8 times. Caution: Do not overarch and compress your belly, only go as far as you are comfortable. When you drop your head, do not bring your chin all the way to your chest. If the weight of your belly actually causes pain in your back, do not do this position. Water takes away the weight of gravity, giving you relief from lower back pain, tired hips, and sore feet. While in the water, bring your knees up and arms out until you float up onto your back. Slowly straighten your legs, while keeping your arms out to your sides. Keep your chin and nose pointed up to the sky. Take in a deep breath and breath out slowly. Lie in this position for 2 to 3 minutes if you can hold it, then lower yourself back to standing in the water. This helps relieve pressure on your knees and lower body. For more comfort, you can roll yourself onto a pool float and hold the position longer. Caution: Make sure you do this in deep water. Shallow water may not be enough to float the baby off major blood vessels. Use sunscreen if you do this exercise in a sunny pool outside. This exercise can help you stretch your groin muscles and open your hips. Lack of gravity makes this an easy way to do leg exercises and get the weight off your hips and knees. Stand in the shallow end of the pool with your back against the pool wall. Bring your hands up on either side of your head and grab onto the side of the pool. Slowly raise your legs until you form an “L” shape with your body. Then open your legs into a “V” as far as you comfortably can. Bring them back together, and repeat opening them. Do this 10 to 12 times, then lower them back down. Pregnancy exercises third trimester caution: Make sure you are in shallow enough water that your head is above water. However, make sure the water is at least chest deep, or you may have too much weight to pick up your legs and cause straining. Always make sure you come up for adequate air when swimming, and do not hold your breath for long periods of time under water.